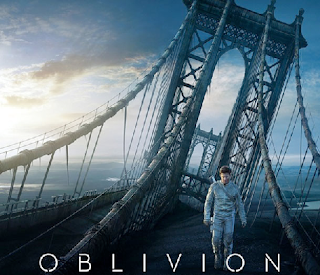 Oblivion is based off a graphic novel of the same name written by Joseph Kosinki. It's a science fiction film that pays homage to Sci-Fi from the 70's. Co-written, produced and directed by Kosinki himself, the film throws you in to the aftermath of a war that left Earth all but lifeless. With the only humans seemingly left on Earth being the "mandatory memory wiped" Jack Harper(Tom Cruise), a drone technician and Victoria Olsen(Andrea Riseborough), Jacks controller, who form "the mop up crew". Fighting off the remnants of the invading army and repairing the drones that defend huge water pumping platforms are how they spend their days. The platforms job being to turn Earth's salt water in to fusion material for humanities new colony on Titan, Jupiter's largest moon. From the start it is clear that Kosinki is taking his themes from classic Sci-Fi -The score of synth sounds that could have been taken directly from 70's/80's and a Total Recallesque identity crisis are but some of the clues that lead to this conclusion. The nods at classic Sci-Fi at times actually do become a little distracting. As the film develops you are shown more about the last 60 years, and how the planet got to it's basically uninhabitable state through the eyes of Tom Cruises character Jack. Cruise, reliable as always, portrayed the part brilliantly. Despite being a fairly unremarkable character Cruise's charisma makes viewers invest in Jack and want to find out more. As Jack struggles with his returning memory his curiosity increases and leads him to some startling discoveries. The discovery of a 'survivor' named Julia (Olga Kurylenko) only leads him further from his mission as a drone repair tech. The movie shows off Kosinki's knack of using CG fantastically, think the exquisite visuals of TRON:Legacy with more realism. The incredible way that future Earth has been realised is something to be applauded. The drone chases through ruined cityscapes and stunning wastelands providing some of the most memorable moments of the film. The only problem with the hugely impressive visuals is that they do make some of the characters seem a little thin, a problem that a lot of modern Sci-Fi seems to suffer from. With out giving too much away, the story throws you down one path only to twist and go down another one that you did not see coming. Leaving you a little blind sided as you think you have things figured out only to be proven entirely wrong. This is pretty much constant right the way up to the films some what barmy climax. All in all a good movie; good visuals, a twisting but enjoyable plot and despite some what weakly written characters a good performance from the cast. Room for improvement but at no point was I bored or un-engaged. I would give the film a 3/5.